A lot of cities have a restaurant week. Restaurants put together special menus for a fixed price. It’s a great way to try new places, go to favorite restaurants or give a local spot another chance. The general idea behind restaurant weeks is to increase business in slow seasons and in Sarasota, summer is the slow season. When I moved to a Sarasota, Polo Grill was a great spot for dinner. The food was good, service solid and the restaurant itself is close. Over the last few years the menu has undergone some changes and our last few visits were disappointing. The last time we went here the service was so bad I actually asked the hostess for a new waiter. Generally I am very patient with waitstaff having worked in a restaurant in college, but even I can get frustrated. 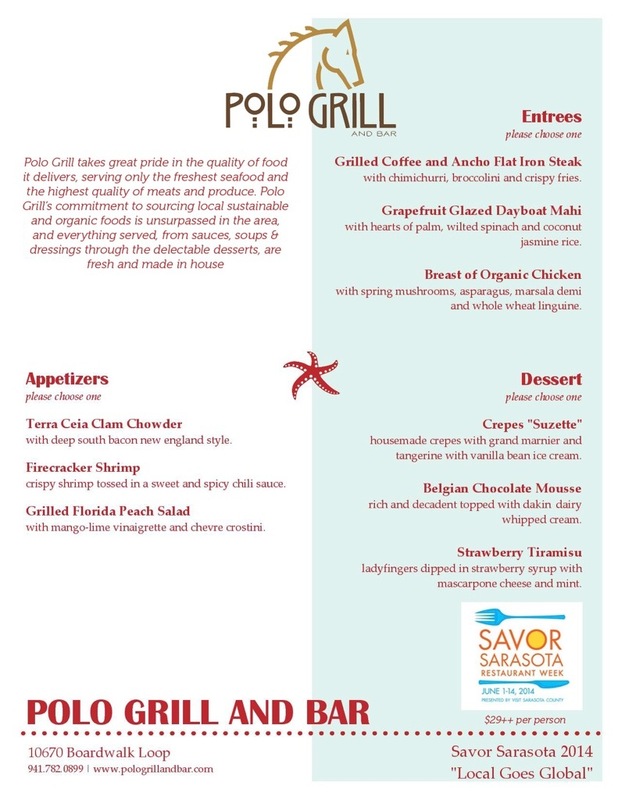 We decided to give Polo Grill a second chance tonight since the Savor Sarasota menu looked pretty good. We headed out early and arrived shortly after they opened for the evening. Service was slow. Again. The waitress was more attentive than the last time we were there, but this went downhill as our meal progressed. About an hour and a half after we were seated we had eaten our appetizers (which were good) and our main courses (ok but not great) but still had no dessert. We waited. And waited. The waitress told us twice that dessert was on its way, but we finally flagged her down and asked for the check. I hate to say it, but this was twice in a row where the food was only ok and the service was terrible. As much as I want to support local businesses, I think this one is crossed off our list.